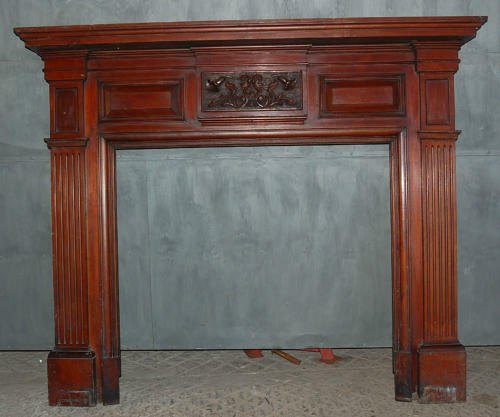 A large carved, antique mahogany fire surround. The surround is Edwardian and has a formal design and pretty carving. The fire features panels below the mantel, one with carved leaf and flower motif, typical of the era. The legs have linear detailing and there is a classic style border around the opening. The mahogany has an old stain or varnish finish and has a rich, reddish, colour. The fire surround is well constructed, solid and heavy, with a large mantel. The fire surround has a metal fixing lug on each side for securing to the wall. There are some areas of damage and wear due to age. There is some residue concrete on the sides of the legs and scratches to the feet, where the fire was removed from its original position. One foot has recieved a chip and the other a small hole. Scratches and marks are present, especially on the mantel and to one side, please see pictures for details. There is some separation to the joints but the fire is solid. There is a small piece of beading missing on the right hand side (when facing the fire). We can repair this for an EXTRA CHARGE. Please contact us for details. There are some small cracks, chips and marks and purchaser will probably wish to refinish the fire. There is a cutout to the legs where the fire was fixed to a hearth. The fire has a very attractive, classic look that would suit a period home. The surround is ideal for a living room or dining room due to its size and would provide great style and character.